By the late 1940s and early 1950s it was clear that the days of improvisation in radio astronomy were over, and that the next steps had to be big ones. In turn, this implied that much planning and lots of money would be required. At the time the two strongest countries in radioastronomy were the UK and Australia. Given the UK were building the large 250-ft (77-m) telescope at Jodrell Bank, the Chief of the CSIRO Division of Radiophysics, Dr EG (Taffy) Bowen, proposed that Australia needed one as well. With considerable funding from the Carnegie Corporation, the Rockefeller Foundation and the Australian Federal Government, the project went ahead. After a preliminary planning stage, the design study was carried out with Freeman Fox and Partners, London from 1955 to 1956 and the design contract from 1956 to 1959. Construction started in 1959 and the telescope was officially opened on the 31 October 1961 by the Governor-General, Viscount De L’Isle. John Bolton’s association with the project began in November 1958 when he made a commitment to Taffy Bowen to return to CSIRO Radiophysics to stand by the construction and commissioning of the telescope and to direct its subsequent operations. Other key CSIRO players in the telescope’s construction and commissioning were Frank Kerr and Harry Minnett. And the plan became a dish. What was out there, where and why? Australia got off to a good start in radio astronomy just after the Second World War. Staff of the CSIRO Radiophysics Laboratory (later the Division of Radiophysics) made use of radio-receiving antennas and other equipment left over from war-time, and turned them from their original purpose of receiving man-made radio signals to studying the natural radio waves produced by objects in the cosmos. The equipment located on the coast at Dover Heights in Sydney was rough and ready, and often improvised (see Radio astronomy at Dover Heights). But by the late 1940s and early 1950s it was clear that the days of improvisation were over, and that the next steps had to be big ones. In turn, this implied that much planning and lots of money would be required. The first proposal was to build a large air-warning antenna that would double as a radio telescope. The Radiophysics Laboratory had close links with the Royal Australian Air Force (RAAF): during the war it had worked for all three services (army, navy and air force) and just after the war it was advising the RAAF on radar and navigation equipment, including air-warning equipment. At the time it seemed that the best way to extend that technology would be to build larger radio-receiving antennas. Radiophysics staff began thinking in terms of dimensions of hundreds of feet. At one stage they proposed to build a wooden antenna, 100 feet in diameter, rotating on a track and costing all of A£365. A large antenna like this could be used for both air-warning and for radio astronomy. But the RAAF was even more strapped for cash than CSIRO, and had no money to put towards such a project. Now a new factor appeared. Unlike Australia, the USA had been slow to take up radio astronomy after the Second World War. The leader of the Division of Radiophysics, Dr EG (Taffy) Bowen, had many contacts in science and industry in the USA, and he urged them to help the USA to take up radio astronomy, mainly by building a large radio-receiving antenna. The proposal fell on receptive ears. The Division of Radiophysics wrote a detailed specification for such an instrument and a program of scientific activities that it could be used for. It was tacitly understood that this telescope would go ahead at the California Institute of Technology, and that the Carnegie Corporation might provide up to US$5 million for it. About the time that these plans for a telescope were being drawn up, the large American foundations such as Ford, Rockefeller and Carnegie were changing their emphasis in supporting science, giving less to the US and more to other parts of the world. Vannevar Bush (President of the Carnegie Corporation) and Alfred Loomis (a Trustee of both the Carnegie Corporation and the Rockefeller Foundation) suggested that the proposed large telescope be built in Australia, with financial assistance from the USA. The Carnegie Corporation had accumulated US$250 000 that it was obliged, for certain reasons, to dispose of in the British Commonwealth, and the Corporation’s trustees granted this money towards the construction of a telescope in Australia. This grant was followed by another US$250 000 from the Rockefeller Foundation. The last hurdle was that the overseas bodies required that their own grants be met, dollar-for-dollar, by the Australian Government. The Australian Government rose to the occasion (the money actually came from other CSIRO sources) and contributed to not only the capital costs but the running costs as well. A year later the Rockefeller Foundation gave a further US$130 000. The telescope now had an assured future and work began on ideas of what a giant radio telescope should look like. One of our bibles was a little book called A Proposal for a Giant Radio Telescope. It’s not exactly in the style of engineering proposals, but was meant to interest the fund-raising people and parliamentarians. I was heavily involved in writing this document, which describes radio astronomy in general, goes on to talk about astronomical and technical considerations connected with a possible giant radio telescope, and ends with a cost estimate. At the time the most interesting thing in the book was a presentation of eight or nine alternative designs. One was a sketch of the UK Jodrell Bank design (Fig. 1a, which came into operation in 1957), a dish to be suspended on two towers. We now regard most of the others as rather wild ideas. Fig. 1b shows one version of an alternative design in which the dish was carried on a sphere in different ways and the sphere either floated on oil or was carried around on rail tracks. I don’t think anybody had considered how to stop the thing from blowing away! But it was all good fun. Fig. 1c is yet another design which runs around a great big hole and finally, in Fig. 1d, we have a design which is starting to evolve towards the ultimate one ‘ a single tower, a single support. One thing that is striking if you stop to think about it, is that the real start of radioastronomy was in 1945, and it was a mere nine years later that Taffy Bowen and others began thinking about a new telescope. Taffy Bowen was very conscious of the dangers of this new venture and was also very good at seeking expert advice. He formed a Technical Advisory Committee (TAC) to help select the consultants for the design study, to specify exactly what they had to do and to assess their recommendations. The TAC included a distinguished English engineer John Roderick, Professor of Civil Engineering at Sydney University and Arthur Wills, an experienced engineer at the Aeronautical Research Laboratories in Melbourne. Freeman Fox and Partners (FF&P) in London, was the design firm chosen. The top people involved from FF&P were Ralph (later Sir Ralph) Freeman Jnr and Gilbert (later Sir Gilbert) Roberts, FRS, a brilliant if somewhat idiosyncratic bridge engineer for the project. Roberts was the partner directly responsible for the project and had been first assistant in the 1920s to Freeman’s father, Sir Ralph Freeman Snr who was design consultant to Dorman Long in their successful tender for the Sydney Harbour Bridge and was afterwards responsible for its detailed design. Robert’s first assistant for the telescope study was MH Jeffrey. Harry Minnett was the Radiophysic’s representative at FF&P in London, available for consultation on CSIRO’s requirements, especially the radio and electrical aspects and to liaise with Sydney on problems and progress. Bowen had arranged for Barnes Wallis to collaborate with FF&P. Wallis advised on the problems of deflection of the telescope’s structure, first by thinking of incompressible columns (he held the patent to this device) and then by recommending automatic compensation for changes to the dish’s parabolic shape (which was in fact used in the telescope). In a significant departure from the design of previous telescopes, Wallis recommended that the telescope’s mounting system (the way in which it is turned and pointed to different parts of the sky) be ‘alt-azimuth’, rather than, for instance, the equatorial mount used on the earlier radio telescope at Jodrell Bank in the UK. And just for good measure, Barnes Wallis came up with the idea of the telescope’s guidance system, the ‘master equatorial’. Wallis’ contributions far exceeded his very small retaining fee ‘ which, in any case, it seems was never paid. The impasse lasted many months and in that period I looked into the basic servo problem myself. Perhaps because I was new to the field and unconstrained by any knowledge of gun servos, I hit on the solution which was ultimately adopted. This system could track or scan celestial objects accurately, even in gusty winds because it strongly resisted all the components in the wind torque spectrum without, however, interacting with structural resonances. Probably the most influential factor was that the Cowra authorities were not interested in our project and wouldn’t give us any assistance in road-building, or anything else, whereas the Parkes’ people saw the possibilities for their town. The then mayor of Parkes, Cec Moon, was a real enthusiast and proceeded to play a role in bringing the telescope to Parkes. During recent discussions I am reminded that the first site we chose was not as far out of town as the present one. It was Taffy Bowen who urged us to go a bit further from Parkes, which we did. We marked out the present site, which was attractive for a different reason. The land-owner at the time, Australia James Helm (born on Federation Day in 1901) was very sympathetic to our project and this turned out to be very valuable in those early days. Cec Moon and the Parkes Council’s vision has been justified. Over 120 000 members of the public visit the Parkes telescope annually. The observatory has an excellent visitors’ centre with two audio-visual theatres and a cafÃ© ‘ a great vantage point for viewing the telescope. The design contract was placed in 1956 and completed in 1959. John Bolton’s association with the project began in November 1958 when he made a commitment to Taffy Bowen to return to CSIRO Radiophysics to stand by the construction and commissioning of the telescope and to direct its subsequent operations. From that point on Bolton was kept up to date with design progress or lack of same and the constant battles with FF&P. In mid-1960 Bolton and Bruce Rule (Caltech’s ‘Dean’ of telescope construction), went to London to have a close look at the FF&P design. They had a mandate from Bowen that what they felt were definite errors had to be modified and what they felt could be improved was to be debated. In the first category was the cross-section of the tripod legs, which they felt were far too small and would lead to torsional oscillations of the entire tripod and cabin structure ‘ they won that argument. Their second objection was that there was insufficient isolation between the main telescope and the master equatorial column. FF&P again gave in but Bolten felt that the modifications did not go far enough and 30 years later believed that the interactions between the main telescope and the master equatorial tower probably accounts for some of the random changes seen in the telescope pointing. After the design contract was completed, the search for a construction contractor commenced. CSIRO finally settled on the MAN Company (Maschinenfabrik Augsburg-NÃ¼rnberg AG) in Germany with Askania-Werke in West Berlin and Metropolitan Vickers, UK as sub-contractors for the master equatorial and servo-drive systems respectively. The contract was placed in 1959 and the telescope completed in 1961. 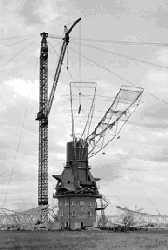 The first was when the aerial cabin had been secured in position on the tripod, it was suggested that a photograph be taken from the erection crane to mark the occasion with some human figures in it to add human interest. It was not a case of not looking back, but rather of not looking down ‘ something I would not care to repeat all these years later. The second was tilting the dish from the zenith for the first time ‘ a dramatic event. Following the Opening, Mike Jeffery supervised the acceptance tests before the instrument was handed over to CSIRO in March 1962. It took nine years after the dedication before all the major faults in the design and construction of the telescope surfaced, and were finally overcome and commissioning considered complete. However for the major part of those nine years, the users of the facility were rarely conscious of the work going on behind the scenes and produced hundreds of scientific papers. The counterweight was insufficient as the weight of the dish had increased substantially between the preliminary and actual construction drawings. The production of the master equatorial and the control desk fell badly behind schedule. When finally delivered the former was an excellent piece of mechanical design and precision engineering while the control desk in John Bolton’s view was ‘pathetic’. The variable speed control for the alt-azimuth part of the telescope did not work and the variable control for the equatorial burned out the motors in less than 12 hours of operation. The first attempt to move the dish in zenith angle produced two large bangs as the dowels locating the zenith angle’s gear boxes on their mounts shot out. The mesh of the pinions to the racks, preset in Germany, was now far too close. This was solved by increasing the clearance and fitting larger dowels into the reamed out holes. At the next attempt to move the dish, the counterweights were seen to be slipping relative to their support arms. Bolton and Mike Jeffery reinforced the bolts by welding. At the next trial the counterweights walked ‘ as predicted by Bruce Rule. Harry Minnett provided an ingenious electrical solution ‘ back-to-back motor/generators which sat in the motor room for years. As John Bolton observed: Many people probably saw them wobble occasionally but never really understood what they were doing ‘ neither did I. The first at 408 MHz was started by Bolton, Gardner, Mackey and associates in 1964 in which they were able to produce a list of about 2 000 southern sources including the discovery of quasars, considered one of the most exciting astronomical achievements at the time. This became the first version of the highly respected Parkes Catalogue of Radio Sources. The survey was published in 4 papers between 1964-1966, later collaborators being Marc Price, Doug Milne, George Day, Ron Ekers, Doug Cole and John Shimmins with the most convenient version of the catalogue put together by Jennifer Ekers in 1969. The second Parkes survey began in 1968 at a frequency of 2 700 MHz and lasted 12 years. It was started by Bolton and Shimmers plus two students Jeannette Merkelijn and Jasper Wall. Others involved later were Ann Savage, Dave Jauncey and Alan Wright. For the first time a special ‘continuum-only’ receiver was built by Bob Batchelor, John Brooks and Brian Cooper who were known collectively as the ‘BBC’. The second survey was completed in 1980. The Parkes 64-m telescope has discovered and catalogued more radio sources than any other radio instrument ‘ not bad for an old lady of thirty! By the time the Parkes telescope began operating some radio-frequency polarisation had been detected by overseas astronomers in our Galaxy (the Crab nebula and the Galactic plane) and outside our galaxy (the Cygnus-A radio galaxy). The first detection with the Parkes telescope of linear polarisation in extragalactic sources was that from the southern radio galaxy Centaurus-A in 1962. Subsequently polarised emissions have been described from many sources. Among the polarisation sources described by Gardner and Whiteoak in 1963 was a suspected supernova remnant Vela-X. Doug Milne followed up this observation and made supernovas his lifelong interest. Parkes scientists went on to note that the direction of polarisation was found to vary as the wavelength squared which was consistent with the Faraday rotation which in turn was shown to be linked to our Galaxy. wandering around ‘ as he usually did, muttering and kicking things, twisting knobs etc. and he saw it ‘ the first pulsar observation at Parkes. Parkes large collecting area makes it a very sensitive instrument ideally suited to finding pulsars (rapidly spinning neutron stars the size of a small city). Two-thirds of the 1 800 known pulsars, including the only binary pulsar system, were found using the Parkes telescope. Another major project was the Pulsar Timing Array aimed at detecting gravitational waves from colliding super-massive black holes (see also Pulsar surveys and the discovery of the double pulsar). GASS, the Galactic All-Sky Survey aimed at mapping the hydrogen gas in our galaxy in high detail. Although designed and operated as a radio telescope for astronomical observations Parkes has also been used for tracking and receiving data from many space probes. Played a leading role in the reception of the first video footage on the first Moon walk (Achievement) by the crew of Apollo 11 in 1969 ‘ featured in the fictional film ‘The Dish’ (see also Parkes radio telescope and the Apollo 11 moon landing). In 1979 NASA launched Apollo 13 ‘ its third mission to the moon. Two days into the flight (320 000 kilometres from Earth) an explosion on board destroyed the spacecraft’s normal supply of electricity, light and water. The crew of James Lovell, John Swigert and Fred Haise were forced to abandon the command module and crawl into the lunar module. The problem was that the lunar module only had enough power for 45 hours operation while the return trip to Earth would take at least 90 hours. The Parkes telescope, under John Bolton’s guidance, was central to securing communications between Houston and the Apollo 13 spacecraft and the successful return of the crew. The Galileo probe to Jupiter, the Voyager exploration to Neptune and Uranus, the Giotto project to examine Halley’s comet and the various Mars missions in early 2004. In January 2005 it was a key element in a global linkup of 17 radio telescopes observing the descent of the Huygens probe through the atmosphere of Titan. the focus cabin ‘ that is the box at the top, where the radio waves are collected ‘ has been replaced with a much larger one which can hold more equipment. But in a sense these are only modest changes. They give us more flexibility, more sensitivity. But I think it is true to say that the concept of the telescope was so well thought out and the construction so well executed, that it has provided a very stable platform on which to improve the electronics and the receiver system. Goddard DE, Milne DK, 1994, Parkes: Thirty years of Radio Astronomy, CSIRO, Melbourne, Australia, 162 pages.